Tampere University Library hosted a two-day satellite event at IFLA 2012 “The road to Information Literacy – Librarians as Facilitators of Learning”, with over 130 library professionals from around the world attending. Many of the visitors continued to the main IFLA conference in Helsinki, but a number of them just came to the preconference in Tampere to hear about the important issues in IL education. The Head of Communications of Tampere University, Katja Kannonlahti opened the satellite conference by saying: ”University staff and students need your help as information professionals. You are not the gatekeepers, but the gate openers. There is nothing without information.” The role of the university library and librarians in the academic society is acknowledged and well appreciated in Finland. At the University of Tampere, the theme of the satellite is very topical, because brand new study programs are being launched this autumn with IL education in the curriculum for all students across the disciplines, and the students are equally offered IL sessions during different phases of their studies. 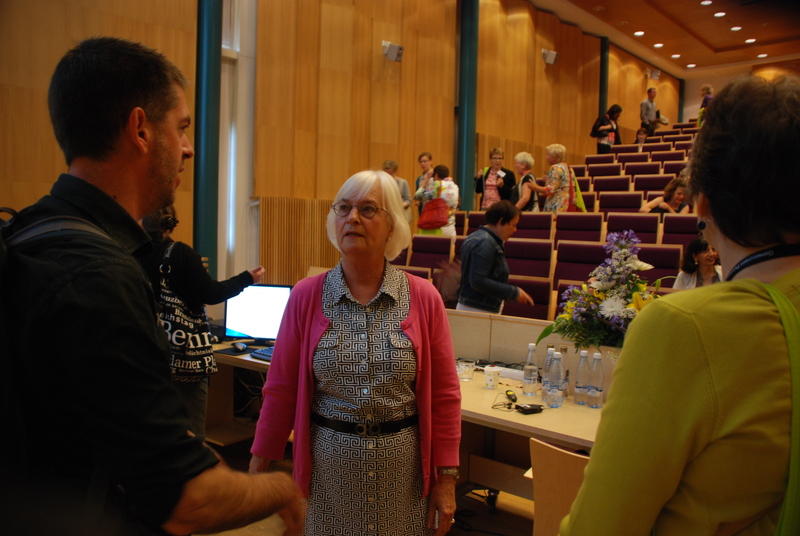 The satellite introduced two distinguished key note speakers, Kirsti Lonka and Carol Kuhlthau. 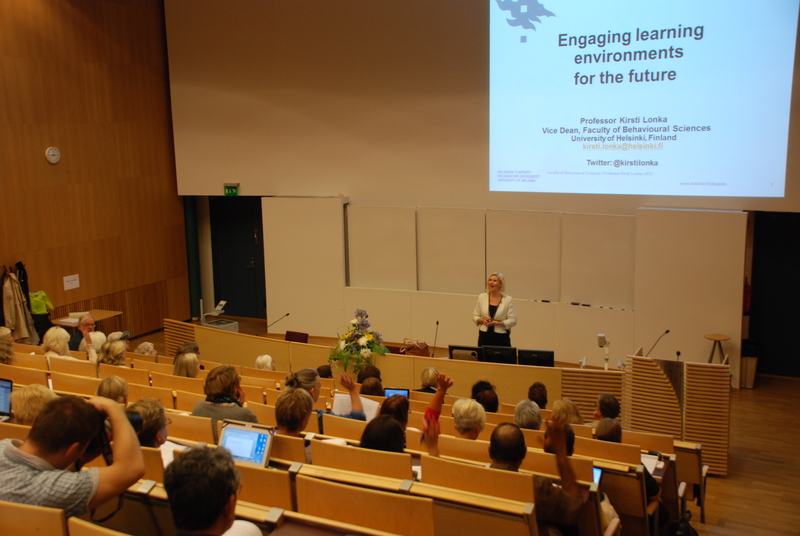 Kirsti Lonka, a professor and vice dean of the Faculty of Behavioural Sciences at the University of Helsinki, Finland, talked on the topic of “Engaging Learning Environments for the Future”. She emphasized the importance of learning technology as a tool for working, not just for entertainment. The students are already familiar with the latest technology, which should be taken into account and utilized, when developing academic working habits and teaching practices. Professor Kirsti Lonka having her presentation. University teachers should stimulate the students’ own thinking processes. In her presentation, she analysed the concept of interest. In fostering the learning process and reflective thinking, she said that maintaining interest is a key element: the students who experience more interest also perform better. Furthermore, even mass education can be engaging and promote a feeling of flow. As the students grow into reflective professionals, they deal with academic emotions, which was an interesting concept in her presentation. She also pointed out the importance of developing and supporting collectively cultivated learning practices, not just an individual learning process. In her opinion, learning takes place in multiple spaces: whether those be the physical, virtual, social, mobile and mental spaces of learning. Designing learning spaces is an important part of designing education, with the new Kaisa House at Helsinki University as her intriguing example. Carol Kuhlthau, professor emerita of library and information science at Rutgers University, United States, gave an interesting key note speech on the second day of the seminar under the title “Librarians facilitating learning through guided Inquiry”. Carol Kuhlthau, perhaps one of the most well-known researchers on the information seeking process has been affected by constructivist theories of learning, authoring and co-authoring the well-known books Seeking Meaning (2004), Guided Inquiry (2007), and Guided Inquiry Design (2012). She wanted to emphasize the role of value-added librarians. She said that librarians are increasingly more needed in the dynamic and cluttered information surroundings, and that it is a common misunderstanding that the library is not needed anymore. 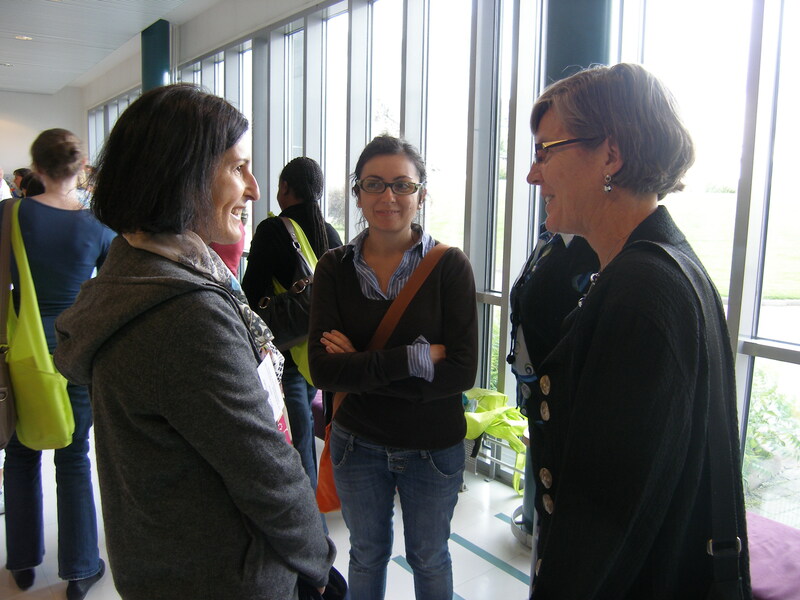 Professor emeritus Carol Kuhlthau discussing with conference participants after her presentation. Professor Kuhlthau said: “Students have feelings, they are thinking and they are doing!” As information literacy instructors, we should understand this tripartite learning process. I think we can conclude that in IL education we should support the students in the cognitive level, as academic thinkers, we should reassure their confidence in using academic information resources as well as give them practical hands-on exercises and teach them to actively use these skills which are crucial for them in succeeding in their academic studies as well as addressing real working life problems. Furthermore, she defined the “library as an inquiry lab for information literacy”. Information workers are in her opinion an important asset to the community. Interesting similarities could be seen in Lonka’s and Kuhlthau’s presentations although they are coming from two academic disciplines. Both see that the idea of interest and feeling are important when it comes to learning, and that the teaching librarian plays an important role in supporting the student in the academic research and study process, stimulating and facilitating that process. 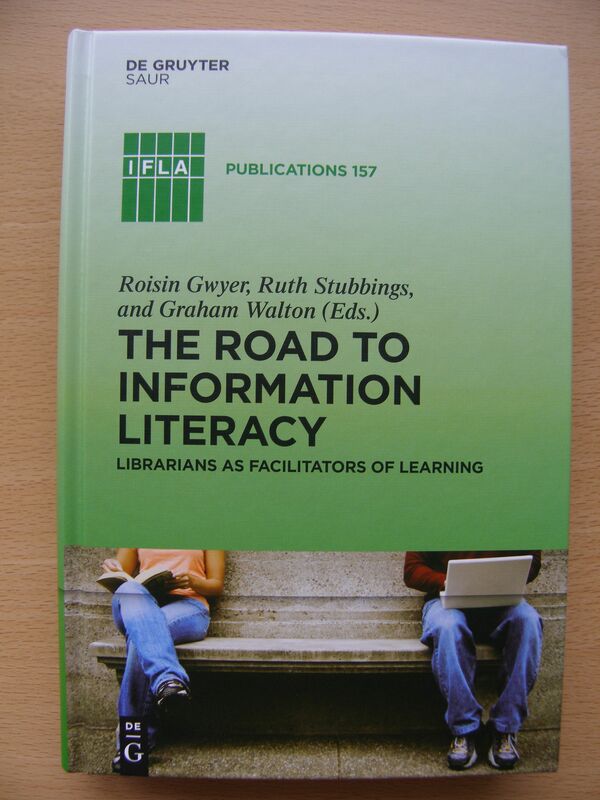 The satellite was sponsored by the Continuing Professional Development & Workplace Learning and Information literacy sections of IFLA, which two main themes were well represented in the program. During the two-day conference, we heard interesting presentations about IL education and professional development from a variety of inspiring angles. Some of the presenters also published their articles in the Conference book. The book offers a chance to look at interesting articles from the professional development perspective as well as take a look at effective information literacy interventions done in different parts of the world. Sharon Favaro from Seton Hall University, USA, talked about first-year students, the role of technology in reshaping research experiences, and using the students’ prior knowledge skills, such as social media skills, to open the door to learning something new. From University of Illinois at Urbana-Champaign came Lisa Janicke Hinchliffe whose two presentations gave important and theoretically grounded yet practical advice in designing and assessing high-quality information literacy instruction, and supporting one’s professional growth. Juanita Jara de Súmar from McGill University, Canada, in her case study pointed out the importance of succession planning in developing IL education. With the aging of the work force, it seems to be crucial for any organization to share best practices among the workers across the generations. Organizations, such as libraries, should be prepared to do some succession planning to retain the institutional knowledge, she said. Eystein Gullbekk and Tove Rullestad from University libraries in Oslo and Bergen, Norway, gave a presentation about Library staff and PhD Students as partners in research and learning, with their case of developing web-based IL education modules. It seems that the topic is very topical for many university libraries, because that session was full of librarians interested in hearing about IL education for researchers. Editor Eileen Breen, whose topic was “IL in the professional literature”, in her case study of a professional library journal had explored which topics where covered in that journal over the years. She identified that there is a gap in literature on the topic of Human resource development for teaching and teaching management. She encouraged information professionals in the audience to share and write about their professional experiences in that area. The satellite conference also offered inspiring surroundings for global networking with other library professionals during the discussions over workshops, group work tasks, poster sessions, coffee breaks and conference dinner. The sun was also shining on the second day of the conference, which was a welcomed surprise to the satellite organizers, after having had such a rainy summer in Finland.